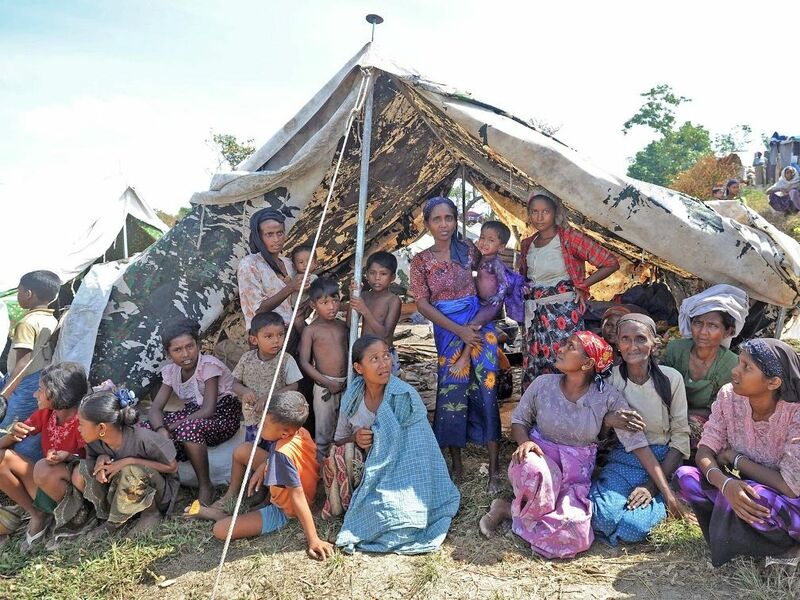 Who will shelter Rohingya women and children from flooded refugee camps following Cyclone Komen's destruction of Rakhine State? Recent media reports have revealed that Rohingya Muslims, including women and children attempting to take shelter in abandoned schools and community centres from tropical Cyclone Komen and heavy monsoon rains that submerged their villages and refugee camps in the township of Kyauktaw, Myanmar, were turned away by the state’s police and army. Myanmar security personnel aggressively turned Rohingya families out of these flood shelters, claiming that these buildings were meant to shelter ‘those who belong to this country’, in a reference to the Rohingya Buddhist population. Forced to flee, the Rohingya went to higher uninhabitable and hazardous areas in the hills seeking shelter. Consequently women and children were exposed to monsoon rains and extremely dangerous cyclone conditions. Accounts have also emerged of Rohingya Muslims who fled to these highlands being threatened by ethnic Buddhists to return to their flooded homes or face dire consequences. The Burma Times also reported on 4th August that Rohingya children, who have fallen sick due to the cyclone and floods, are being refused treatment by local hospitals in the country, leading to a number of deaths. It wrote that local hospital authorities are stating that they will not give treatment to Muslims as they are foreigners, and the facilities are only for Rakhine’s Buddhist population. According to the paper, 7 year old Abdul Malik, 5 year old Abdul Karim, 5 year old Mohammad Anis, and 5 year old Elam Bahor died due to this withholding of medical treatment. Pregnant Rohingya women are also enduring unbearable suffering due to the lack of medical care. Myanmar security and government officials in the Rakhine state continue to behave in the most barbaric of ways towards Rohingya Muslim women and children. Their appalling treatment of these vulnerable people reflects their genocidal policies that aim to remove the existence of the Rohingya Muslims from the Arakan region. Myanmar’s conscienceless regime was aware in advance from meteorological forecasts and reports of where and when Cyclone Komen would hit. However, they failed to give any advanced warnings to the Muslims of Arakan, preferring the Rohingya to become helpless victims of the floods, abandoned in dangerous conditions or subject to violence from surrounding ethnic Buddhists. The intolerable suffering of Rohingya women and children continues in ways unimaginable. Yet all that emerges from international organisations and Western governments is hollow words of condemnation against Myanmar’s brutal regime. The regimes of the Muslim world on the other hand, including those neighbouring Myanmar such as Bangladesh, Malaysia, and Indonesia have washed their hands of the Rohingya women and children, forsaking their Islamic and human duty towards them in the name of preserving their own selfish national interests. These Muslim rulers and their nationalistic, capitalistic systems have been an iron chain around the neck of this Ummah. They need to be removed urgently and the Khilafah upon the method of the Prophethood established which will work to save the life, property and honor of the Muslims, regardless of their nationality. It is a system under which the Khalifah Al-Walid ibn Abd al-Malik sent Muslim armies under the leadership of General Muhammad Bin Qasim to rescue Muslim women and children who were captured by a Hindu Raja Dahir in southern India, which resulted in the liberation of the whole area of Sindh from the despotic Hindu rule. Such a Khilafah state is needed again urgently to rescue the poor Rohingya Muslims from the oppression of the Buddhists. "بھلا کیا وجہ ہے کہ تم اللہ کی راہ میں اور ان کمزور مردوں، عورتوں اور ننھے ننھے بچوں کی نجات کے لئے جہاد نہ کرو؟ جو یوں دعائیں مانگ رہے ہیں کہ اے ہمارے پروردگار! ان ظالموں کی بستی سے ہمیں نجات دے اور ہمارے لئے خاص اپنے پاس سے مددگار بنا"